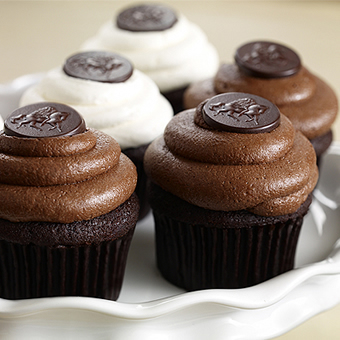 Godiva cupcakes, image stolen from their website since I didn't find any. Our original goal today was to get a cupcake at the Godiva store, mainly because we have a Godiva gift card. Free cupcakes are sometimes the best cupcakes. However, we apparently misunderstood Godiva’s website. Even though the icon that means “Godiva Stores offering baked goods” was next to the Bellevue Square location, we didn’t see any baked goods at the store. DARNIT! Maybe one day I’ll be willing to order Godiva cupcakes from their website but (surprisingly enough) I am not enough of an addict to pay $51.95 for 6 cupcakes ($28 for cupcakes and $21.95 for overnight shipping). Update 11/23: Cupcakes are only available from the website, so I guess I don’t be trying them any time soon. After wandering around Bel Square for a bit, we headed out to Trader Joes. On the way, we were sidetracked by New York Cupcakes. We chose the following 4 cupcakes. (I really didn’t want 4, but there was a discount with 4 which netted us 4 cupcakes for $10.) The descriptions in italics are from the NY Cupcake website. My reviews follow. Classic white cake filled with creamy vanilla custard, topped with decadent dark chocolate frosting and finished with a dollop of whipped buttercream on top. 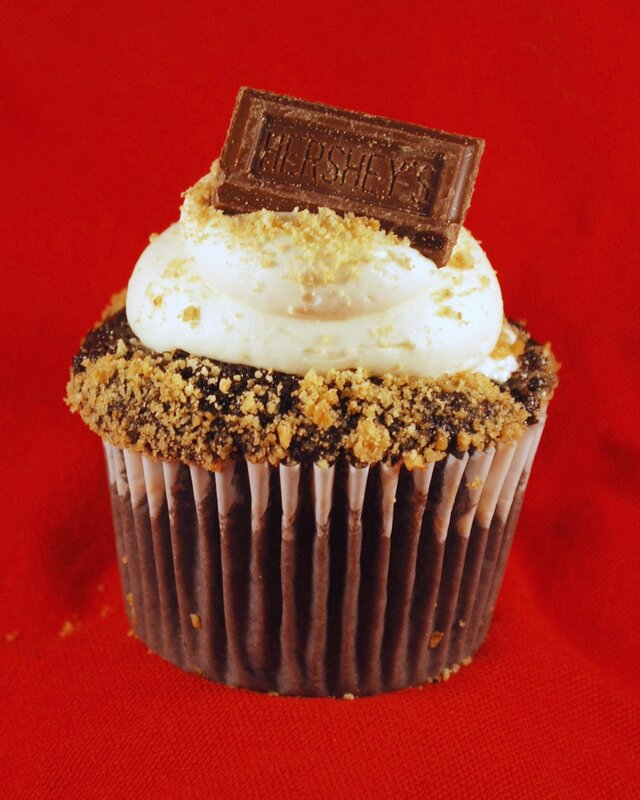 Get on board with our classic chocolate cake topped with sweet marshmallow buttercream frosting and finished off with golden graham cracker crumbs and a mini Hershey Bar . 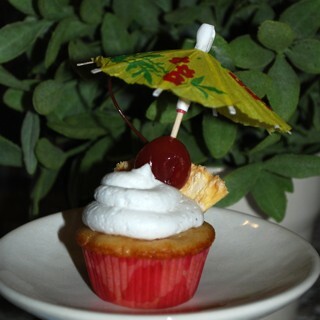 This cupcake is incredibly cute. I love the mini Hershey® bar on top. It makes it seem more home-made and less “snooty”. Review to come. I’m full right now. The cake was really nice…might have been the same cake batter as the Milky Way, but my palate isn’t that advanced: moist with deep chocolate flavor. It had a sticky marshmallow fluff sort of filling that I really liked and a graham cracker crust at the bottom…or the crumbs might have sunk before baking. I couldn’t finish the frosting: way too sweet. I guess if the bakery is calling it “sweet…frosting” rather than just “frosting”, it’s got to be overloaded with sugar. Rating: ♥♥. It would have been ♥♥½ or ♥♥ if it had the marshmallow fluff on top instead of the frosting. Our best flavors have come together! 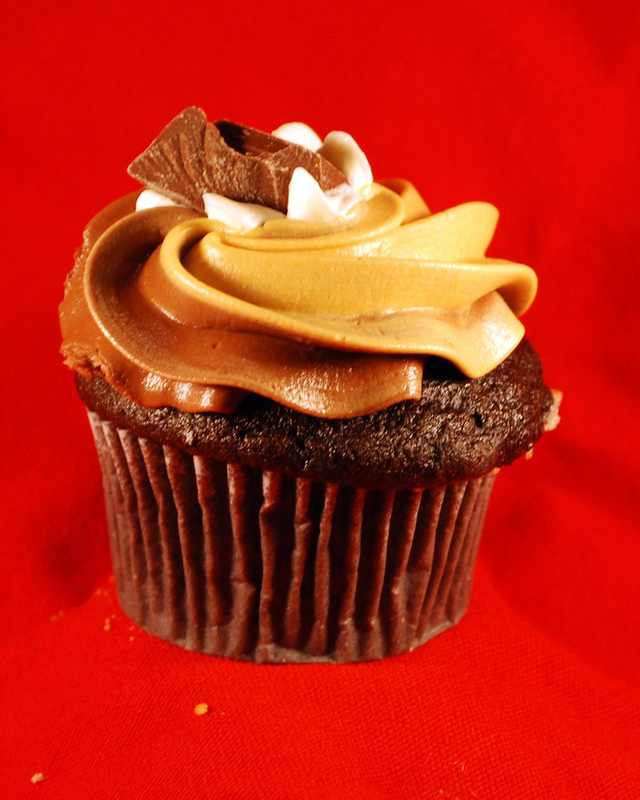 Classic chocolate cake filled with white fluffy buttercream and topped with a swirl of creamy caramel and fudge frosting. Not your ordinary lunch treat! 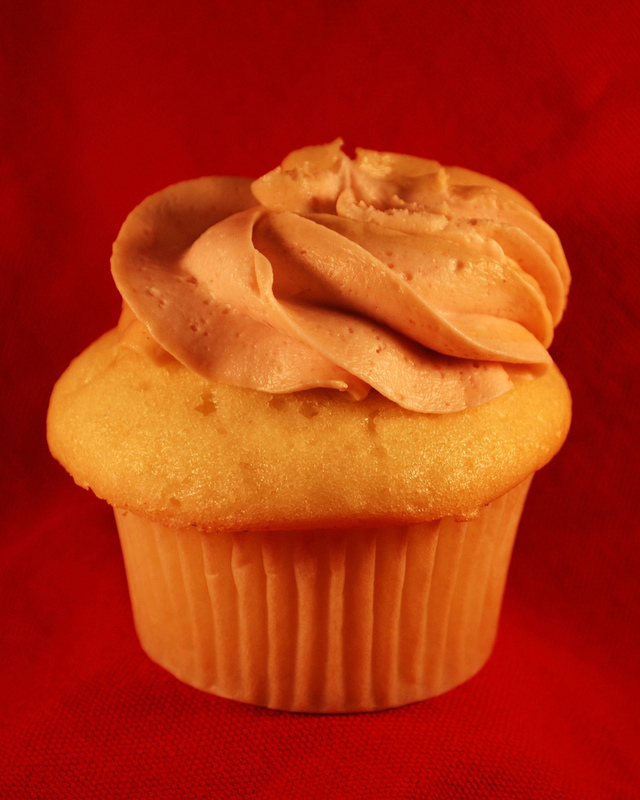 Classic white cake filled with raspberry jelly buttercream and topped with a swirl of creamy peanut butter frosting. Disclaimer: I don’t like raspberries, so that may taint my rating somewhat. Mr Shuck thought it didn’t have a distinct enough jelly flavor compared to the peanut butter and mused that it might be better with jelly in the center rather than flavored frosting inside. The peanut butter taste was very strong in the icing, but the icing was creamy instead of grainy so that was a plus. The cake was moist and I have no complaints about it. (Mr Shuck said the cake was delightful.) My rating: ♥ ½. Mr Shuck’s rating: ♥♥♥. New York Cupcakes overall is worth a trip back, despite it being 17.63 miles from my house according to Mapquest. I’d probably not make a special trip out to Bellevue, but would go out of my way if in the Bellevue area. 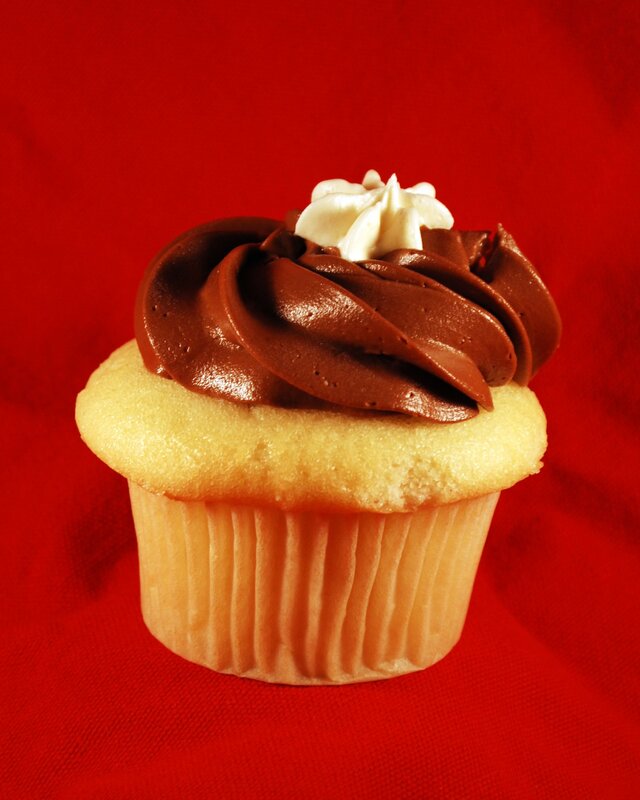 Godiva cupcakes are offering a special now for free overnight shipping on their cupcakes. Are you gonna try em? It’s still $8.95 for shipping. That’s $6 per cupcake. What if they aren’t tasty? I think they should send me a free sample! OMG! Got the Godiva cupcakes for valentines day and can I just say…they are worth the money. even at full price shipping. seriously, I cant believe how good they were! I have a Godiva gift card….I guess I’m going to have to give in and get them.